Step 1: Draw a straight line through line 4. Step 2: Draw a straight line back to line 3. Step 3: Draw a straight line into space 2. Step 4: Draw a "C" around line 2. How easy is that! I like to chant "Straight through 4, back to 3, into 2 and add a C". 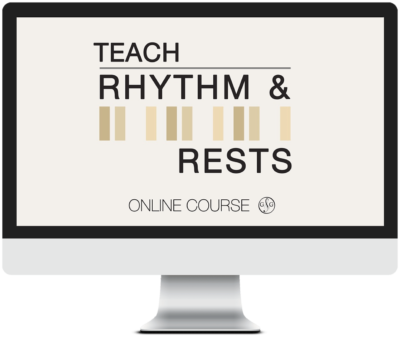 Rest Values are introduced on Pages 43 and 44 in the Prep 1 Rudiments Workbook. Students have the opportunity to trace dotted lines to ensure that they are drawing quarter rests properly. Mia was so excited to get a sticker on these pages, and to understand how to draw her rests properly. Using this simple step-by-step system gave Mia the 4 steps to draw her quarter rests successfully. Can you see that I clip the bottom of the pages in her Theory Workbook as she completes them? This helps Mia to know where she is and it helps me find her current work quickly. Clipping when Completed is just one of the dozens of tips that I learned in the Ultimate Music Theory Certification Course and it has saved me so much time at my lessons. 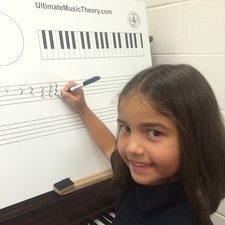 If you have not checked out the Online Ultimate Music Theory Certification Course click here now! Download your free Drawing Quarter Rests - 4 Easy Steps Worksheet. The Prep 1 Rudiments Workbook introduces students to the foundation of music - notes, rests, rhythm. No matter what method your student is using, they can use the Prep 1 Rudiments Workbook to support learning. 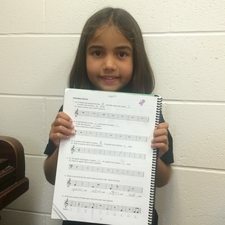 Many teachers have asked why students need to start the Prep 1 Workbook when they start music lessons. My answer is simply that when you learn to read, you also learn to write; when you learn to play a game, you also learn the rules; when you learn to cook, you also learn how to measure the ingredients. So, when you learn to play music, you should also be learning how to read and write it too. P.S. - Join the Conversation: Do you have a way to help students draw a quarter rest? Please share it with us. P.S.S. - To Download your free Drawing Quarter Rests Worksheet, just move your mouse to the "Download your free Drawing Quarter Rests" line - this is called a hyperlink. Just click on those words and it will take you straight to the Worksheet. Isn't technology awesome! I start with the letter Z and add a C. One has to make the Z a little lopsided, but the students understand it right away. Many years ago, I was subbing for a music teacher in an elementary school. I’ve never forgotten the words he had on the chalk board describing how to draw a quarter rest: Zig, Zag, Zig, Curl. Works every time!